Our judge for the KCPS 2015 Summer Salon on Monday was Glen Howey. We had an excellent turnout of some forty members to hear his views on a record high for the number of digital entries – 41, together with 33 prints. So the total number of entries was likely a record as well. It was interesting to see the different interpretations on the set subjects of “Intimate Moments” for prints, and “Let’s Make Music” for digital. Glen awarded Honours to five images, and Highly Commended to 24. Congratulations to all those awarded, but especially to the newer members Susie Whelan, Jan Meese, Chrissy Garlick, Gary Key and Joy Svendsen. The images can be viewed in the 2015 Summer Salon Gallery which is now online. Following the judging, Glen showed around 90 photos from his current project “Please Demolish With a Kind Heart”. 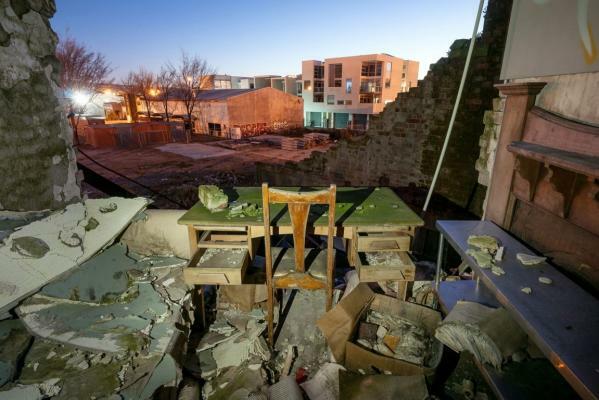 This was a fascinating, slightly scary, very sad, look around many wrecked homes and buildings in Christchurch. One example is seen below – there are more via Glen’s website and in recent news stories such as “Man risks death to capture quake memories“. We are so lucky to have such talented local photographers who not only provide constructive thoughts on our Salon images, but also share their recent work like this. Thanks Glen!